Mature male supervisor writing on clipboard. Senior constructor making a note on clipboard on Alpha Channel background. Male contractor writing on clipboard, green screen. 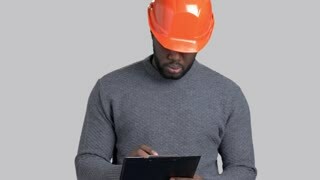 Caucasian engineer worker making a note on black clipboard, alpha channel background. Mature building inspector writing on clipboard. Senior man in white helmet making a note on clipboard, chroma key background. Mature architect making a note on clipboard. Confident engineer writing on clipboard on Alpha Channel background. Serious mature man writing on clipboard. Confident caucasian supervisor writing on clipboard, Alpha Channel background. Confident mature supervisor writing on clipboard. Senior man in white helmet writing on black clipboard on chroma key background. Afro-american supervisor writing on clipboard. Handsome dark-skinned engineer making a note on clipboard on grey background. 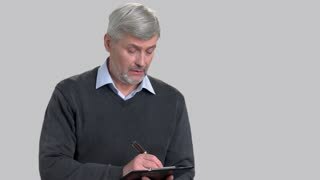 Confident mature man writing on clipboard. Caucasian supervisor making a note on clipboard on grey background. People and occupation concept. Mature supervisor writing on clipboard. Handsome caucasian man making a note on clipboard on blurred background. People, paperwork and inspection. Serious architect writing on clipboard. Mature engineer in hard hat making a note on clipboard on checkered window background. Confident supervisor at work.